Display a caratteri con interfaccia Seriale o I2C. Il prodotto include il display e il modulo di controllo. La modalità di pilotaggio viene selezionata tramite un jumper posto nella parte posteriore. E' possibile collegare al modulo una tastiera a matrice 4x3 in maniera diretta. 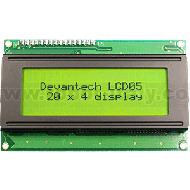 The I2C and serial display driver provides easy operation of a standard 20 x 4 or 16 x 2 LCD Text display. 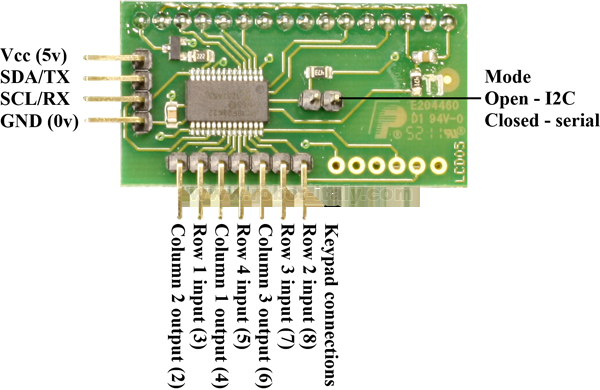 It requires only a 5v power supply and the two data connections for either mode, freeing up pins on your processor. 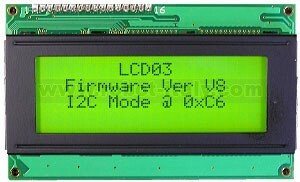 The LCD05 controller is our new generation LCD display driver and adds additional features to our previous LCD03 driver while being fully compatible in both software and pin-out. A single jumper link is used to select Serial or I2C mode. When the jumper is present (factory default) the module is in serial mode. When the jumper is removed the module is in I2C mode. The mode jumper is only checked as part of the power-up sequence, so make sure the display is off before changing modes. If you change the link position while the module is powered, nothing will change until next time you switch on. Because the I2C communications operate faster than the display can accept data, all commands and text you send to the display are placed in the FIFO (First In, First Out) buffer. This data is sent to the display as fast as it will accept it. The FIFO is 100 bytes in length and the number of free bytes can be returned in either mode. When sending lots of text to the display, you should check the number of free bytes so you don't overflow the buffer. If the buffer does overflow, the excess bytes are ignored. The FIFO buffer exists in Serial mode too, but at 9600 the display is fast enough and you are unlikely to need to check it. The I2C display is located on the I2C bus at an address of 0XC6. The SCL and SDA lines should have pull-up resistors on them somewhere on the bus. You only require 1 pair of resistors for the whole I2C bus, not specifically for the LCD05. They are normally on the master controller and you may already have them. If not, anything between 1k8 and 10k should work. I recommend 1k8 for best noise immunity. The LCD05 has four registers, three being read only information registers. Register 0 is a dual purpose register, when written, it is the command register where all of the instructions from the commands section should be sent. When read it returns the number of free bytes in the FIFO buffer. The Current address is displayed every time the module is first powered as a default, this may be changed to no display or custom display by user command. The Serial mode operates over a link with a baud rate of 9600 bps (no parity, 2 stop bits) and 5v signals, Do NOT connect RS232 directly to the module - you will destroy it. Use a MAX232 or equivalent to convert the RS232 levels to 5v. Operation is with the same command set as the I2C mode with an additional set of commands to request data to be sent i.e. the software version. Contrast and brightness may be adjusted using software commands to vary the level between 0 and 255. Following a power cycle the LCD05 will automatically revert to a predetermined level for the display that is attached. 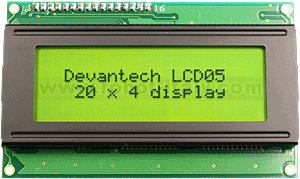 Because there are four variations of the LCD display that the LCD05 connects to a software command can be used to switch between them. Custom characters can be generated by sending an 8 byte map. The first thing that must be done is to send a command of 27 to indicate that you intend to make a custom char. Next you have to specify the position in ram of one of the 8 available chars you intend to build, the 8 chars are mapped at positions 128-135. Then the pattern should be sent as below. Eight bytes are sent with the highest bit masked on, the next two bits are ignored (x) and the final 5 bits show the line pattern. Now the char is built into a memory location it can be called at any time as long as the module remains powered by simply sending the address between 128 and 135. An added feature of the module is the ability to connect a 3 x 4 Keypad, the module will automatically scan the status of the keys at regular intervals. The result is then provided in two bytes for easy use, shown by the diagram below. Each bit represents the row and column of each button on the keypad. The second row is the keypad characters when using our keypad. Any key press will result in the corresponding bit in the byte being driven high. In I2C mode these bytes are available for reading from registers one and two. In serial mode, just send 16 to the LCD05 and it will reply with the two bytes as above with the low byte first.